I finally got to the point where I desperately needed a filing cabinet in my office. It had started to get cluttered looking and frankly, not very attractive. It has been kind of ignored in the whole decorating scheme and I realized that since I spend more time in this room than any other in my home, it was time for a makeover. I knew I did not want one of those ugly metal cabinets and I just did not have the energy to paint one and make it all cute. I also knew I couldn't afford one of the lovely wood ones from Pottery Barn, Ballard or Restoration Hardware. I did some research on line and found a very affordable one from HomeDecorators.com. I ordered it, and it arrived a week later. I had to put it together, but it was worth it, to get what I wanted. I had a roll of anaglipta (is that how you spell it?) wallpaper that I snapped up at a garage sale last year and I knew instantly that it would become the the face of the drawers. Didn't it come out spiffy??? So with that task accomplished I took to organizing my desk. One of the things I can't stand is all those cords around the computer! I took one of those great shoebox style storage boxes that you can get from Michaels and I cut 3 circles on 3 sides with my exacto knife. Then I just threaded the cords through the holes and Presto! No more messy cords! There is even a reclining chair to take breaks in or watch Netflix from my computer. Such a neat idea with the filing cabinet - somehow it is hard to get away without one of these units with the multitude of paperwork which bombards us these days! Love the wallpapaer covering the fronts. Looking all cosy and comfy in that place we have to be so much of the time ! Love the lace wrapped cushion idea!! What a beautiful space to work in! I just got done with the last piece of furniture for my studio today, yeah!!! It feels good to have a nice and inspiring place to work doesn't it. May you enjoy many happy hours in your new space. Nice touches, Karen! I love the filing cabinet ~ it looks wonderful with that paper on the drawer fronts. You should have your office look pretty, especially if you spend a lot of time in there. Your office is a little bit of heaven, I would be in there all the time, not working, just admiring. You've done a great job putting it all together. love it!! What good and creative idea. The chair are just beautiful. That looks beautiful! I love the lace (I think you said it was a runner) tyed on the back of the chair. Great idea --looks so sweet! So very lady like! Great job...love the desk chair. I like the new 4 drawer filing cabinet and fronts you made - I have 2 drawers and it's a blue metal one; yours is much nicer! My chair is a proper desk variety but my back was still killing me so an obus form with elastic to go around the back fit the bill for me. Functional but no femininity to my office. As I type, I can still see your work space; it must be inspiring to work there. Not only a happy camper but also a very stylish one! I adore what you did there and the whites and pastels are stunning! Looks fabulous! All your work paid off... and organizing IS a lot of work!!! Don't you just love how you feel when you enter this room now?!? Really lovely! Lots of great ideas there! Love the box for all the cords - must try that! Ahhhhh, beautiful AND functional?!?! Purrfect! Now I must look around a bit more and again (third time) because certainly you styled a place just for me. You did, didn't you???? Romeo and the chaperon - "her"
This is a gorgeous space Karen! Love what you have done with making it so soft and feminine. The mannequin is beautiful and I might just have to copy your pillow/tie back on my chair! Nice job, it's stunning! I LOVE how that filing cabinet turned out! ADORABLE! The whole office is so cute. But, every room in your house is. HUGS! You have such wonderful ideas! I love what you did with your file cabinet. And your cute cushion idea is adorable. I'd love staying in my office if it looked like yours. Thanks for sharing your wonderful ideas with us. That is a great looking space and very inspirational. I love what you did with the archive drawers. Seeing as how I was just there a few weeks ago, it looks almost totally different......great job pretty lady. As you can see, I still haven't done anything to my blog, even with all your wonderful help. Having had to deal with my mom's move and the hubby losing his job has kind eaten away at my mojo and creativity levels. I loved all the stuff! They are great! Great idea on hiding all of the cords! Your studio is beautiful! Wow. That wallpaper on the filing cabinet fronts is AWESOME! What a wonderful idea! And I adore the way you tied the pillow on the chair with the lace! Beautiful!!! Hi Karen,,, how adorable. I know you will have very many happy and productive hours in such a pretty space! Its been beautiful weather, I hope you are out and about to enjoy it this weekend. Great idea with the pillow and runner tied on the chair!. Your office looks absolutely beautiful to say the least. Confession: I am a copy cat, so I'll do this cuz my back needs some cush! Many blessings Karen. What a gorgeous office! I love the way you made it functional AND beautiful! Bravo! Wow Karen I would enjoy working in your pretty office. I love what you did with the filing cabinet and the cords and your chair! I am wondering what you did with the box with the cords--did you cover it with that thing sitting on the top? You did a great job on it all! Have a good weekend! Wow! Love the filing cabinet! Very, very clever use of the wallpaper. It looks wonderful. I love the bow on the chair, too. Karen, What a lovely office. 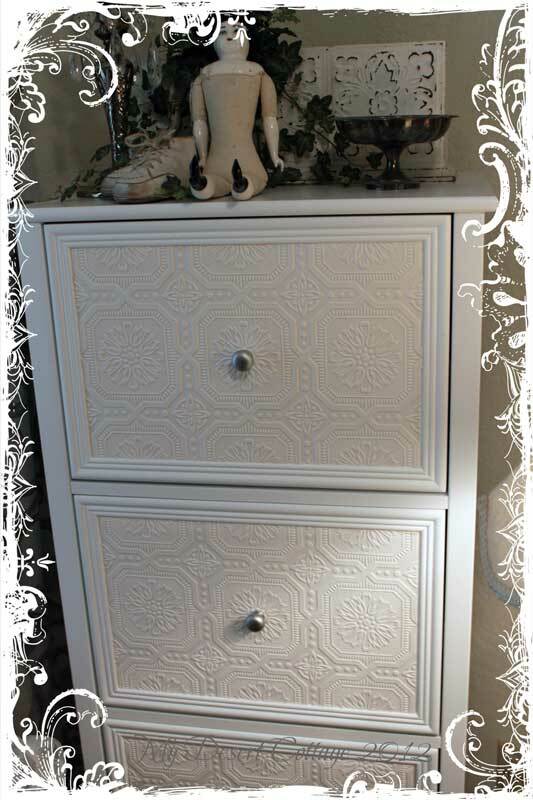 I love the treatment on the file cabinet and all your pretty touches! Want to come and redo my office? What a wonderful office. That's an area of my home that desperately needs a facelift. Hope to do that before too long. You had some great ideas here. Looks so pretty! Your office looks beautiful. Makes me think mine could use a redo. My home office is 1/2 office and 1/2 craft room. It is getting a bit full and disorganized. I need to make it pretty as I spend a lot of time in this room as well. Very attractive makeover! Makes me want to change a few things around! 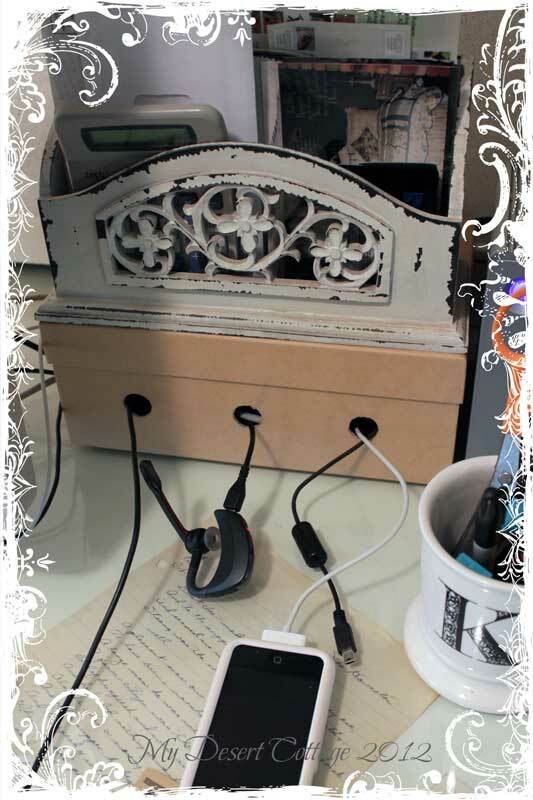 Love your office! I put that wallpaper on my bedroom ceiling in my former house. It took forever and oh my aching back!! but looked like tin ceiling after I painted it gloss white. I love your idea with the filing cabinet! Clever girl! I love it. Beautiful and functional. I LOVE the wallpaper on your cabinet. So so cool! I would love to put some of this on mine! 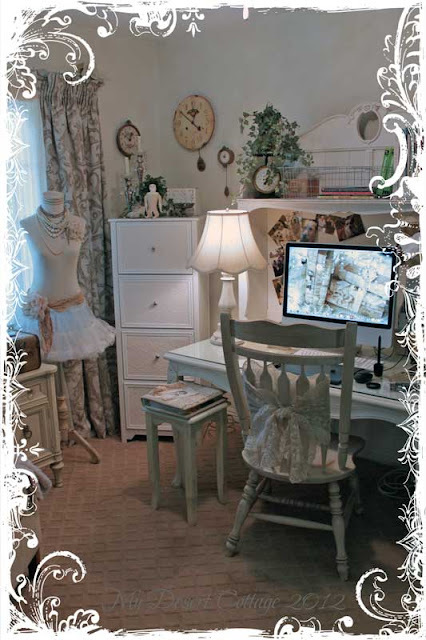 My studio is really needing a redo too. Your chair is adorable with the pillow. Great idea using the runner. And the shoebox! I need to do that too! I just hate when the cords show. Your office turned out really pretty, Karen! Thanks for the inspiration! 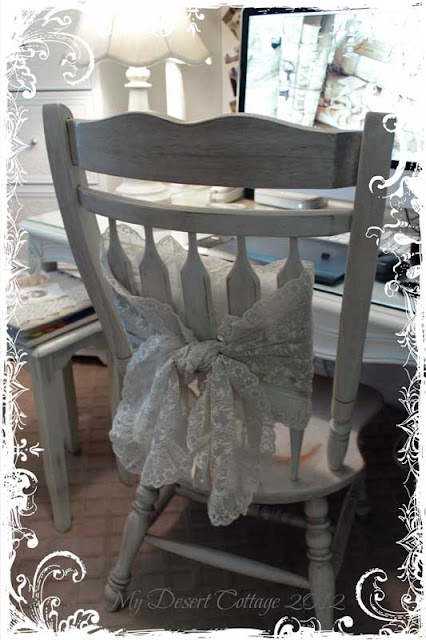 I love the chair pillow and tieback idea - so pretty! I'm so jealous of your office redo! I need one so badly!! Your new changes are beautiful and efficient-- your office is a perfect solace for work. I love that you have a lounge chair for watching movies on your computer-- way cool! You are a lucky girl! Ps- congrats on your speaking engagement in April- that will be a great conference and they are so lucky to have you! Ohhhh this is just sooooo very pretty! I love it! Love the filing cabinet finished look. Great work and thanks for sharing.